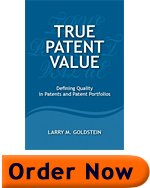 This chapter introduces patents to people who do not have significant background in patent law. It provides a summarized view of some key points related to either (1) obtaining a patent from the patent office, or (2) revising a patent after it has issued in what is called a “reexamination proceeding”. To Continue to Chapter 2 –Click Here.